AT&T Shared Data Plans: Are They Right for You? Shared data is the future at AT&T and Verizon. Both companies have introduced new wireless plans that use a single bucket across multiple phones, tablets, and hotspots. Verizon's "Share Everything" plans are available now, and replace individual and family plans for all new subscribers. Existing subscribers can hang on to their own plans, but they'll have to pay full price for new handsets (around $600 for high-end phones) if they want to keep using unlimited data. 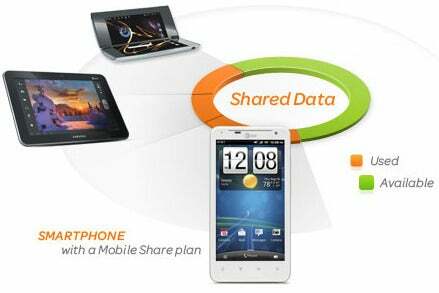 AT&T's "Mobile Share" plans launch in August, but are not mandatory for new or current subscribers. Also, unlimited data will still be available for grandfathered users who purchase subsidized phones (but, of course, speeds will be throttled after 3GB each month). Both carriers refer to their respective plans as "simple," which for any wireless carrier is always a relative term. There's still a bit of complexity involved, and you'll need a calculator handy to see if these plans will save you any money over existing individual or family plans. To make things easier, we've put together a side-by-side comparison of shared data plans from AT&T and Verizon. The main difference between the two plans is that Verizon charges a flat rate per phone, while AT&T provides per-phone discounts at higher data tiers. Also, Verizon scales its tiers in $10 increments and never sets each tier more than 2GB apart, while AT&T spaces it tiers more sporadically but offers bigger data buckets overall. Given that AT&T charges $15 per GB for overages, AT&T customers will need to be more careful about which tier they choose and how much data they use. Both plans include unlimited voice minutes and text messages, and in most cases, subscribers with minimum talk and text plans won't save any money by switching to shared data. But if you're already paying for lots of voice and text, and you're not coming anywhere close to your monthly data limit, shared data plans are worth considering.